Yes, we know he won two Super Bowls. Even after Eli Manning’s 200 consecutive regular-season NFL starts, quantifying his career is difficult. Manning is in his 14th season, and nearly every one has felt like a crossroads. Which quarterback would show up for the Giants: the one capable of winning two Super Bowl MVPs — or the one capable of leading the NFL in interceptions for three seasons? The answer was probably somewhere in between. 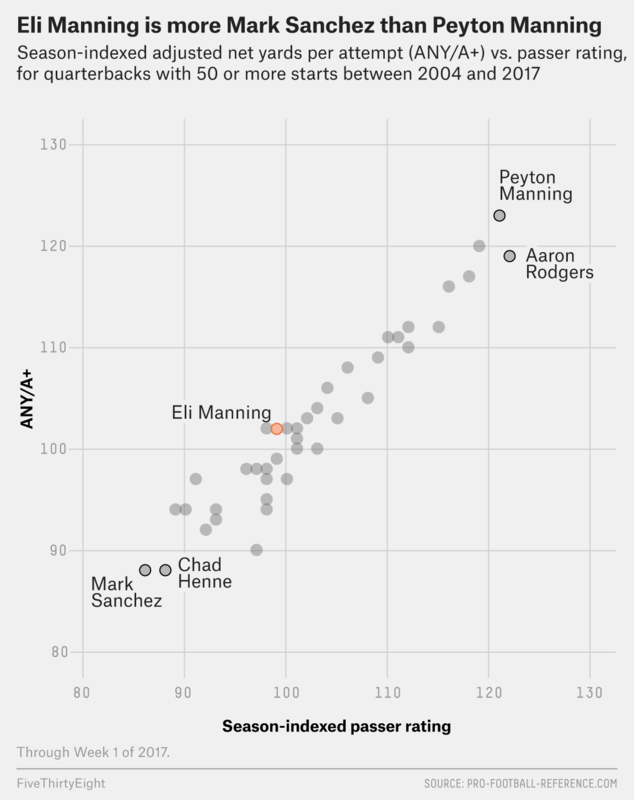 Manning has been reliably, and historically, mediocre. Only 10 quarterbacks in NFL history have started at least 200 games, according to Pro-Football-Reference.com, and the list is a who’s who of all-time legends: Peyton Manning, Tom Brady, Drew Brees, Fran Tarkenton, Dan Marino, Brett Favre, Warren Moon and John Elway. And Eli Manning. And, OK, Vinny Testaverde — but still. Save Eli Manning and Testaverde, all have been enshrined in the Pro Football Hall of Fame or are virtually certain to be. Among that group, Eli Manning ranks either last, or ahead of only Testaverde,1 in nearly every season-indexed rate stat: completion rate, yards per attempt, interception rate, passer rating, adjusted yards per attempt, net yards per attempt and adjusted net yards per attempt. The truth is, the NFL’s eighth all-time leading passer has produced like a below-average starter across his entire career. That average contains some really low points, like his miserable 27-interception 2013 season, when he finished 35th in passer rating in a league with just 32 teams. But that is as close as Manning has come to truly poor play. That reliability — that no matter how much he teases us with flashes of greatness, he at least definitely won’t be bad — has prompted the Giants to lean on him for more than a decade. What’s more, he’s rewarded that trust: Tonight, Manning will make his 212th consecutive start, the longest active Ironman streak in the NFL — and third-longest in the history of the league. Above all, that may be Manning’s greatest skill: just being there. Since he took the starting quarterback job away from Kurt Warner in November 2004, the Giants have not had to worry about the position, allowing the team to devote resources and draft picks to other areas. By comparison, the Giants’ roommates, the Jets, have started 15 quarterbacks in this span. The Cleveland Browns have started 23. But considering that Eli will turn 37 in January, how much longer can the Giants expect this to last? Quarterbacks seldom hang on to starting jobs beyond age 35. Then again, elite quarterbacks have blown past this expiration date — especially in recent years. Brady and Brees combine for 78 years of life, and together, they threw for more than 800 passing yards when they faced off on Sunday. Favre, Moon and Eli’s brother Peyton all played some of their most efficient football very near the end of their starting career. So maybe Eli Manning will soon reach a never-before-seen level of performance? But even his best passing performance, in 2011, still couldn’t match up with the best of his peers’. He threw for 501 more yards than he ever had before or ever has since, but 543 fewer than Brees that season. Manning gained an impressive average of 8.4 yards per attempt, but Aaron Rodgers gained an average of 9.2. Manning’s passer rating in 2011, 92.9, was worlds away from the NFL-record 122.5 that Rodgers posted that season. Even if Manning finds another level sometime soon, he’ll still be several levels shy of Brady, Brees and Rodgers’ best. But this is why advanced statistics exist: to help isolate a player’s performance from that of his teammates’ (hello, defensive lines and David Tyree) and to compare his performances against those of his peers. That analysts at major outlets were still citing rings and wins to claim that Eli is better than Peyton as late as 2013 is proof that we still need to look deeper. A handful of high-leverage highlights can’t outweigh hundreds of games’ worth of mediocre play, not when we’re trying to pick the best of the best. But then, Eli Manning has never been one of the best. No, the most prolifically mediocre quarterback in NFL history is in a class all by himself. In Testaverde’s defense, he spent nearly a decade toiling away on some bad Buccaneers and Browns teams. PFR’s Advanced Passing table contextualizes passing rate stats by indexing them to the league average over three seasons with the given season in the middle. 100 is average, higher is better. See the PFR Glossary for details. Hall of Famer Roger Staubach’s career average completion rate (57 percent), TD/INT ratio (1.4:1) and passer rating (83.4) were all below 2016 NFL team passing averages (63.0 percent, 1.9:1, 87.6).